Mission Vets Landry Gilpin is chased and tackled by Mission defender Aleksander Gomez during the 2nd quarter of play at Tom Landry Stadium on Friday, August,31, 2018, in Mission. Shortly after Mission Veterans and Brownsville Veterans learned they’d be opponents in the Valley’s largest district, the countdown to their first regular season matchup was officially underway. The Patriots and Chargers, who were both champions of their respective districts in 2017, will face off at 7:30 Friday night at Mission’s Tom Landry Stadium in The Monitor’s Game of the Week. Brownsville Veterans is off to a 2-0 start following a 50-13 win over Brownsville Rivera in Week 1 and a 32-12 victory over Brownsville Lopez in Vets’ district opener last week. The Chargers replaced Gustavo Vasquez, the Brownsville Herald’s 2017 All-Metro Most Valuable Player, with junior Liam Longoria at quarterback. Longoria completed 14 of 21 passes for 168 yards and a touchdown while also running for three touchdowns on the ground against the Raiders. Longoria wasn’t as successful through the air in Week 2 versus a stingier Brownsville Lopez defense (3-of-10 passing, 33 yards, no touchdowns), but he was prolific on the ground, running the ball 15 times for 100 yards and four touchdowns. Junior running back Mauricio Garza was the other Charger to hit the century mark against the Lobos, piling up 149 yards and a touchdown of his own. Brownsville Veterans’ running attack appears to be as strong as ever with 11 of the team’s 12 offensive touchdowns coming via the ground game. 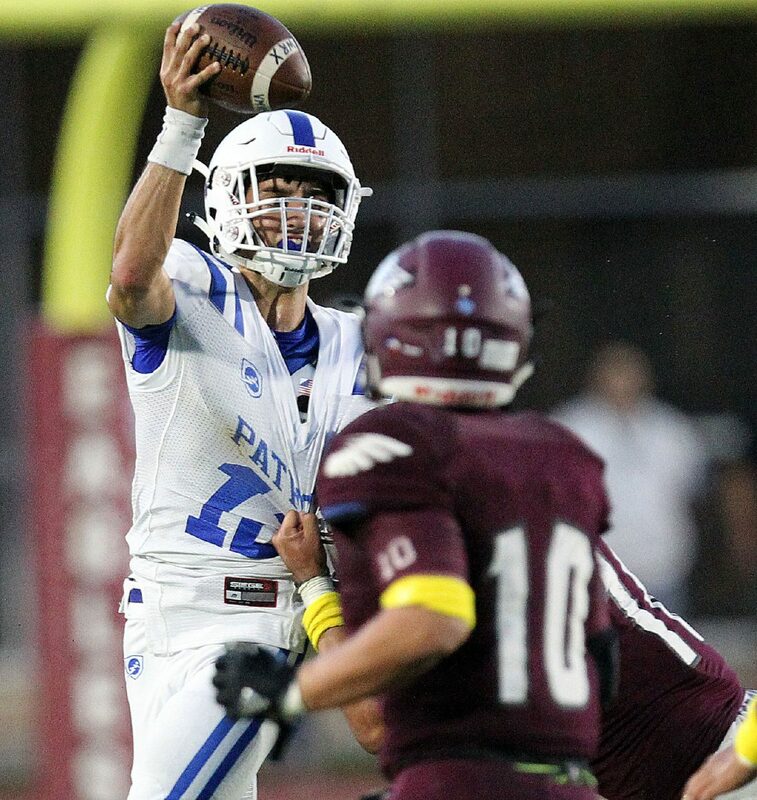 Mission Veterans lost to rival Mission High in The Monitor’s Game of the Week two weeks ago. 2017 All-Area Player of the Year and senior quarterback Landry Gilpin was not his typical self on the field, completing less than 50 percent of his passes (14 of 31) and throwing two interceptions in the Patriots’ 24-12 loss. Even in defeat, Gilpin threw for 203 yards and a touchdown while also running for 106 yards and another score. The Patriots rediscovered their identity in Week 2’s district opener on the road at PSJA Memorial. Led by Gilpin, Mission Veterans scored all of its points (41) in the first half on the way to a blowout victory. Gilpin threw for three touchdowns and ran for the other three. Junior wide receiver Mikey Garcia was the recipient of two scores, and sophomore A.J. Gonzaque caught the first touchdown of his varsity career. Brownsville Veterans has proven to be a run-first team, and that could be an advantage against a Mission Veterans squad that struggled to stop the run in its season opener, yielding 265 rushing yards in the loss to Mission High. The Chargers, on the other hand, haven’t faced and won’t again face a quarterback of Gilpin’s capability this season. Dynamic receivers like Garcia and Gonzaque won’t make matters easier, either. Despite taking place in mid-September, the Patriots versus Chargers matchup will have major playoff seeding implications in mid-November. Mission Veterans’ 7-1 district record was good enough to earn a share of a district title last season. Meanwhile, Brownsville Veterans hasn’t lost a district game since Sept. 29, 2016. The last time the Patriots and Chargers met on a football field was in the bi-district round of the 2016 playoffs. Mission Veterans won 35-14.